Members of the Home Development Mutual Fund (Pag-IBIG), a government-run savings and mortgage fund, are setting aside large amounts of money and placing these in a special savings program that provides above-market returns for placements maintained for five years. Voluntary contributions to Pag-IBIG Fund’s Modified Pag-IBIG2 (MP2) savings program more than doubled to Php1.14 billion in the first five months of 2018 from only Php454.5 million in the same period last year, according to a press release by Pag-IBIG Fund issued July 13. The latest figure is already triple the contributions to the program of only Php362 million in 2014, a sign of its rapid growth. Membership in Pag-IBIG Fund is mandatory for all private sector and government employees, who contribute a minimum of Php100 a month to the fund. They can then turn to it for short-term loans as well as mortgage to buy or build a house. Contributions earn dividends from the fund’s lending programs, and are returned to members after they retire. About 90 percent of Pag-IBIG Fund’s assets consist of housing loans or mortgage sales contracts. The rest are made up of small short-term loans to members. 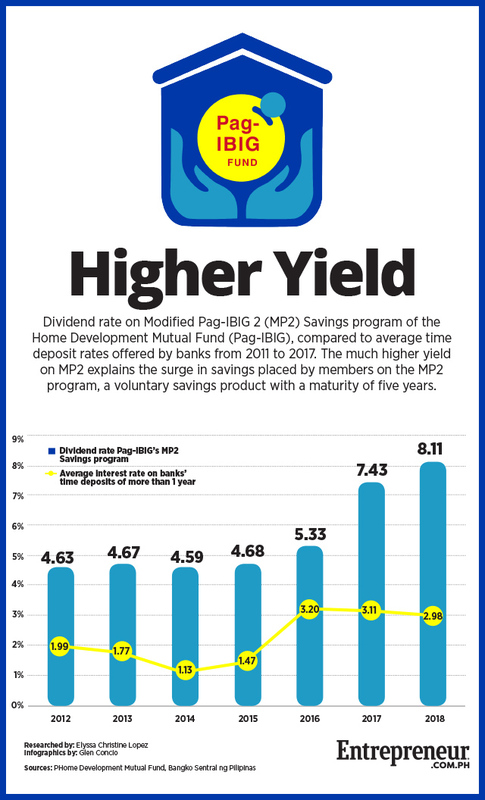 In a bid to boost contributions and encourage members to save, Pag-IBIG Fund also rolled out voluntary savings plans that pay annual dividends above prevailing market rates for deposit products and even government or corporate bonds. Launched in 2010, the MP2 is perhaps one of Pag-IBIG Fund’s more popular voluntary savings programs. For a minimum monthly contribution of Php500 over 60 months or five years, members can earn 50 basis points above the fund’s annual dividend rate. For 2018, the annual dividend rate for MP2 savings is set at 8.11 percent compared to the regular dividend rate of 7.61 percent, which were based on the fund’s performance in 2017. These returns are higher than the average interest rate of only 2.98 percent offered by leading commercial banks on time deposits in 2017, based on data from the Bangko Sentral ng Pilipinas (BSP). However, Pag-IBIG Fund’s dividend rates vary from year to year. From 2012 to 2015, MP2’s dividend rates only ranged between 4.63 percent to 4.68 percent. These steadily rose to 5.33 percent in 2016 and 7.43 percent in 2017. But given the company’s performance in recent years, it looks like members may still enjoy higher-than-market interest rates for a long while. In 2017, the company’s net income was Php30.27 billion, up from the previous year’s Php25 billion. HDMF has also recently adjusted the requirements needed to get into the MP2 program, which may encourage more members to save through the investment scheme. Starting this July, the company has extended the program to retirees who may have other sources of income, as long as they have contributed for at least 24 months to Pag-IBIG prior to retirement. It has also waived the Php5,000 monthly gross income requirement for members who wish to become part of the program. Pag-IBIG Fund CEO Acmad Rizaldy Moti said retirees, particularly those who previously served in the government, have become more interested in investment instruments that can help them earn money even after years of work. For more information, visit the Pag-IBIG site. How Rich is House Speaker Gloria Macapagal Arroyo?